Sometimes after an exam, bankers tell us that they feel like they've had a target on their backs. Perhaps this is not just a figment of their imagination. After all, there is a regulatory target and you can see it pictured just to the left. This diagram is not actually a target but rather, a radar screen created by the San Francisco Federal Reserve Bank. It helps to illustrate bank supervisors' focus and areas of greatest concerns and therefore is a great tool for banks. The way it works is that those items closest to the center of the diagram are the most worrisome risks and the bigger the letters, the greater the regulatory concern. We realize the picture is pretty small but you get the idea. Risks are always in flux and some issues that previously have been central areas of regulatory concern have moved further away from the center as the credit crisis has waned. Note such topics as CRE concentrations, the overheated multifamily market and looser underwriting standards. These are still on the radar screen, but they are not as worrisome right now given the economic trajectory. 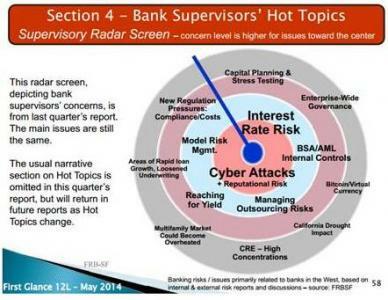 However, smack dab in the middle in great big letters we find Interest Rate Risk and Cyber Attacks. The concern over interest rate risk comes as a result of the long cycle of low interest rates and an expected shift toward rate hikes in coming months. Recall it has been 10Ys since there has been a cycle of Fed rate increases, so it will represent a big change for the industry and will manifest itself as not only interest rate risk, but credit risk as well. Interest rate risk is internally generated and therefore most management efforts and solutions are also internal. Cyber risk on the other hand is the result of external events. There have been so many data breaches and card fraud instances that they have become 4th page news. The press may think ho hum, another data breach, but bankers are not allowed this kind of complacency. We are entrusted to look after our customer's money and anytime something goes wrong, it costs money, time and can damage the bank's reputation. Here are some statistics around this cyber issue. A survey by CDW found that 49% of banks experienced a cyber security attack in the past year. Experian reported that 43% of companies had a data breach in the past year, up from only 10% the year before. As an indication of the size and scope of what can occur, JP Morgan said their recent cyber attack compromised customer information for 76mm households and 7mm small businesses. This is not a small scale problem and with the success of criminals in getting information and money, it is not going away. The more knowledge that a banker can have about the techniques and solutions regarding cyber attacks, the better off you will be. For this reason, PCBB has invited a cyber security expert from the US Secret Service as a guest speaker at our April Executive Management Conference. Shawn Bradstreet comes to us from the San Francisco Field Office of the Secret Service and is the supervisor of the San Francisco Electronic Crimes Task Force and the Bay Area Identity Theft Strike Force. His broad experience in the electronic and financial crimes divisions of the Secret Service allows him to bring a unique perspective to this growing problem. Mr. Bradstreet will tell tales from his experiences, illustrating how breaches occur, current cyber crime trends and most important, outline lines of defense at your bank's disposal so that your bank is not a target. Don't miss this and other captivating subjects at this year's PCBB EMC. The conference will be held once again at the beautiful historic Palace Hotel and we hope to see you there. Corporate bond prices put pressure on the Treasury market causing yields to see a 2bp rise by the close of the day. Yields are down 1bp ahead of ADP employment. 1) Wintrust Financial ($20B, IL) will acquire Community Bank-Wheaton/Glen Ellyn ($343mm, IL) for about $42mm in cash (50%) and stock (50%). 2) Wilmington Savings Fund Society ($4.9B, DE) will acquire Greater Delaware Valley Savings Bank ($421mm, PA) for about $92mm in cash and stock. 3) Sterling National Bank ($7.4B, NY) will acquire payroll funding company Damian Services Corp. for an undisclosed sum. Damian provides payroll services, tax preparation and invoicing to staffing firms. 4) Howard Bank ($691mm, MD) will acquire The Patapsco Bank ($227mm, MD) for about $10.1mm in cash and stock. 5) Springleaf Holdings Inc. will acquire Citigroup's subprime lending company OneMain Financial for about $4.25B in cash. The combined company will have 1,967 branches in 43 states and nearly $14B in consumer finance receivables. 6) PayPal will acquire mobile payment startup Paydiant for about $280mm. Paydiant will allow merchants using PayPal to create branded wallets and prioritize preferred payment types (like gift cards or store branded credit cards). Banks active in CRE lending should note that research by real estate firm CoreNet Global finds the average US office workplace is now down to 150 square feet per worker (about half what it used to be some years back). Increased technology, less support staff, better desk designs and other factors have all contributed toward the shrinkage. At the last FOMC meeting, policymakers discussed when and how to raise interest rates and left the door open to moving this summer in saying "it might be appropriate to begin policy firming in the near term." Bankers will have to wait and see, but preparing now and testing your exposures is always a good idea.